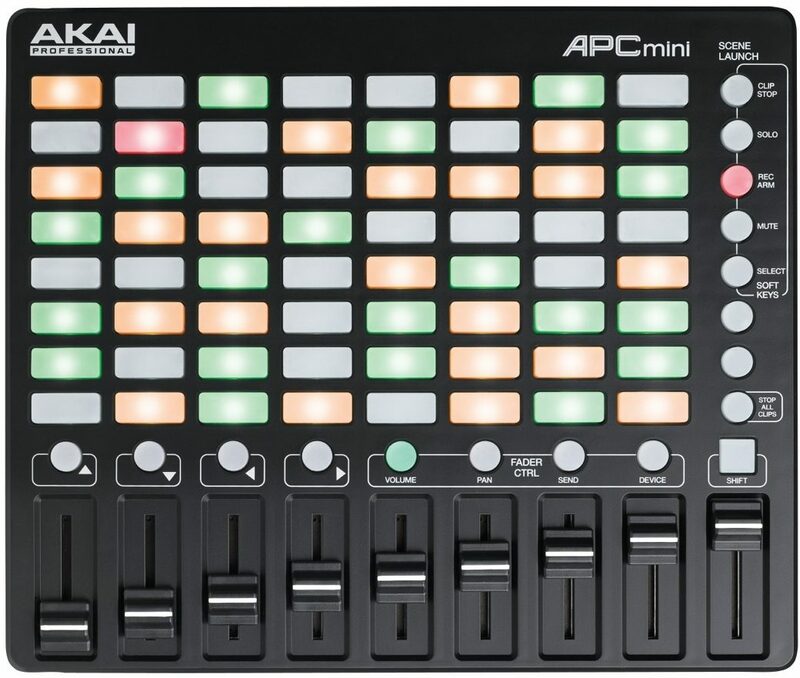 Akai Professional packs serious power into its APC mini controller. With full Ableton compatibility, eight assignable faders with one master, and USB-powered plug and play setup, it's ideal for electronic musicians on the go. Dexterous, versatile, and powerful, the only thing "mini" about this Ableton controller is the size. Engineered specifically for the mobile musician and the desktop producer, APC mini concentrates the essential features of the APC40 mkII, Akai Pro's flagship Ableton controller, into a compact design that fits in your backpack. The result is a dynamic instrument that empowers you to make music with Ableton Live -- anywhere. 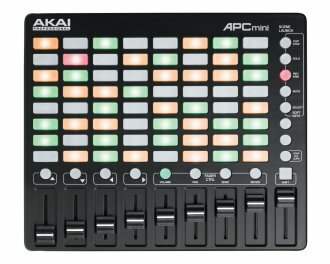 APC mini features an expanded 8x8 multicolor clip-launching grid that's built for hands-on exploration: launch clips and create or perform your song from the ground up using 64 responsive triggers. Tri-color lighting provides visual feedback and displays three clip statuses -- loaded, playing, and recording -- so you can perform without looking at your computer. Plus, you can use the Shift button and directional arrows to manipulate the scope of the 8x8 grid. Nine channel faders allow you to mix with a reinforced fader design. Users can change channel-fader functionality with the dedicated buttons for volume, pan, sends, and device control: fade clips in and out of the mix; pan instruments to the left, right, or center; raise the level of reverb or other effects to create fluid transitions; open and close filters for lush sweeps; and much more. Additionally, each fader is completely assignable for flexible mixing and mapping options. APC mini comes pre-mapped to Live for an instant performance and production setup. When APC mini is plugged into your computer, its hardware controls correspond 1 to 1 with Ableton Live's interface -- no additional configuring required. For APC veterans, all of APC mini's controls can be re-assigned on the fly for customized setups that change with your performance or production style. Whether you are an electronic music artist and Live is your canvas, a DJ using Live for performance and real-time mixing, or a more traditional musician using Live on stage or in the studio, you will find the APC mini to be the intuitive, powerful instrument that directly links your inspiration with Ableton Live. APC mini comes packed with a version of Ableton Live, a high-definition virtual synthesizer, and professional samples and loops for immediate out-of-the-box music creation. Ableton Live Lite enables musicians and producers to spontaneously compose, record, remix, improvise, and edit musical ideas in a fluid audio/MIDI environment. Hybrid 3, by AIR Music Tech, is a virtual synthesizer for electronic musicians, DJs, sound designers, and music producers who love to get their hands dirty. Create anything from fat, retro synth sounds to edgy, modern leads and everything in between. Toolroom Records artist launch packs bring you the coveted sounds of electronic music with a premium collection of sample packs, produced exclusively for Akai Professional. Same Day Music is an authorized dealer of Akai products.